Brandy was adopted at 9 months of age in 1990 and had no formal training up to that point. 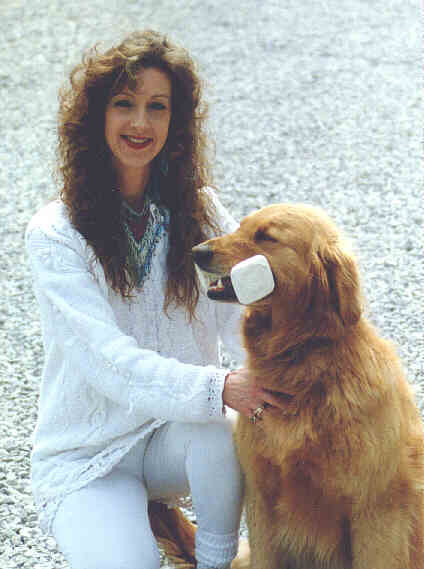 She became a pet first and Kim took over her training late in 1992. She earned her CD in the Spring of 1993 with placements for every leg in Novice B and no NQ's. Brandy was a consistent performer and placed in Novice B all but twice out of all the times she was shown. She earned her CDX in 5 trials in Spring 1995, again placing for every leg, as well as placing each time she qualified. She was retired from obedience shortly after earning the CDX but came out of retirement in the Summer of '96 to do group Team obedience and a Freestyle routine at DogFest. After encouragement from her fellow trainers, Kim brought her back into training in November 1996 for Utility. Brandy did exceptionally well in her training and was looking forward to earning her UD in the Spring of 1998 when a ruptured spleen revealed a cancer in late 1997. She died in February of 1998. Click here to read her Parting Prayer. In addition to her fabulous obedience career, Brandy "accidentally" became a Therapy dog. Substituting for Kim's Lab Ginger, who was nursing a bad shoulder, Brandy visited the Tut Fann Veterans Home in Huntsville. She was such a natural at it, that she had become the regular, visiting every other Friday. She was most happy when being petted by as many people as possible, and was extremely gentle with the residents. Brandy was presented at the Humane Society's Dog Ball in late March 1997 and did a Freestyle performance at the Decatur Kennel Club's Pet Fair in May 1997.